Light grey wool silk morning coat suit for groom. Single matching fabric covered button closure. Peak lapel. 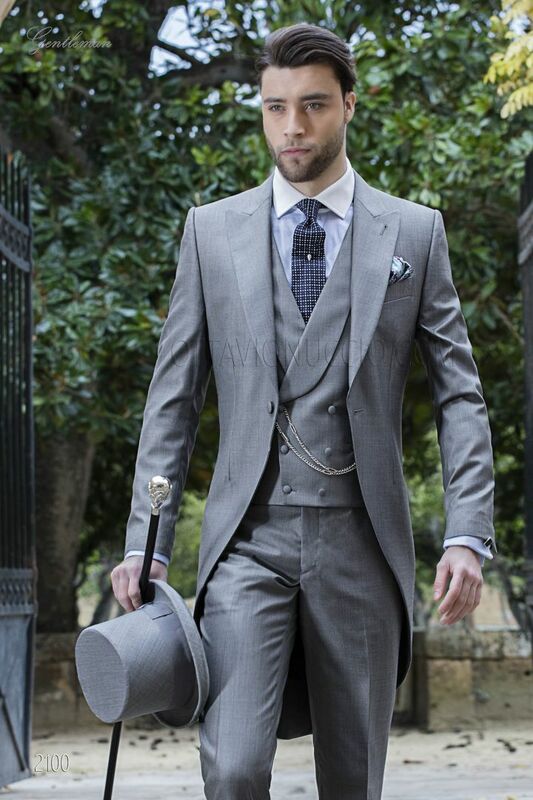 Single vent... Light grey wool silk morning coat suit for groom. Single matching fabric covered button closure. Peak lapel. Single vent, redingote-style seams and classic pleats with twin covered buttons at rear. 3 buttons at cuffs. Weste mit Schalkragen, zweireihig geknöpft, perlgrau, aus "New Performance"-Stoffen, 6 Knöpfen. Krawatte 8,5 cm, blau mit weiße Mikromuster, aus reiner Seide. Ganz handwerklicher Bearbeitung. Einstecktuch, blau im Paisley Design, aus Seide. Zylinder, hellgrau, aus Wolle-Seide Fil-a-Fil.